I waited for months to get my hands on a copy of this book, and finally couldn't stand the wait any longer, so I splurged on the the hardcover when I was in San Francisco and visiting City Lights Bookstore. Both the wait and the splurge were worth it. 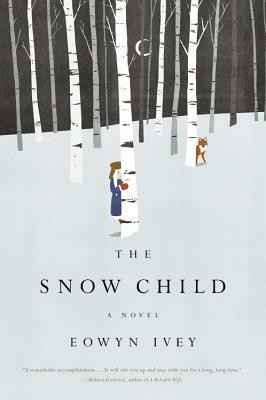 The Snow Child follows the lives of Mabel and Jack as they try to make a life for themselves in the wilds of Alaska. It's 1920 and homesteading is a harsh and lonely life. Mourning the child they always wanted but never had, Jack and Mabel exist in a distant marriage until one magical night they build a child out of snow. From this moment on, their lives are never the same. Eowyn Ivey's words bring the wilderness to life, with intoxicating sights and smells that leave you dizzy with the need to be outside, to breath the fresh air. This novel sparkles like the ice and snow that swirl through its pages. It is a love story and a story of survival, a story of belonging and a story of letting go. But at its heart this is really a story about holding ourselves together when the forces that threaten to tear us asunder aren't only found in the dangers of a wild and uncharted territory, but also in the depths of our hearts.